Graphic designer Peter Sloper added the warning tape. 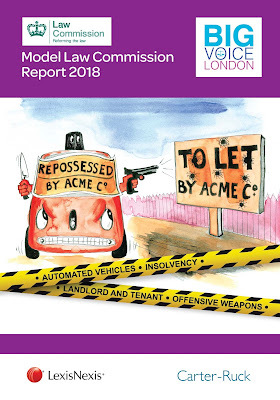 Big Voice London has just launched its sixth annual Model Law Commission Report, proposing reforms to these areas. When the participating A-Level students presented the report, I awarded my personal prize for advocacy to the one who rescued his performance by relying on charisma and said, 'You know what I'm trying to say.' A Top QC said he'd try it out on the Lord Chief Justice. Big Voice London is a social mobility and legal education charity. It enables pupils aged 16-18 at non-fee-paying schools to engage with law and legal policy, helping them to enter the legal profession should they wish to. If you want to get involved, its courses and events offer plenty of scope for volunteers who include law students, law professionals and academics. The Chief Executive Officer is Victoria Anderson, a solicitor at Carter-Ruck specialising in media and commercial law. Succession: that the category of persons who can succeed a tenancy be expanded and that up to two statutory successions be permitted. Service charge: that transparency be increased as to the cost and use of service charge and that a means by which service charge can be challenged be introduced. We have proposed: greater protection for creditors, compulsory director training, the introduction of pre-packs in statute, and greater government intervention. We have also called for greater research into the implementation of our recommendations such as in the amount a business will contribute to a saving account. Compulsory training for those operating automated vehicles. Lanes created on motorways designated for automated vehicles and automated-vehicle-only zones in urban areas. We strongly support an increase of funding and investments towards youth clubs and other projects that increase awareness of the risks of carrying offensive weapons. We propose a removal of the fancy dress defence. There are certain loopholes that provide a defence during periods of the year, such as Hallowe’en.